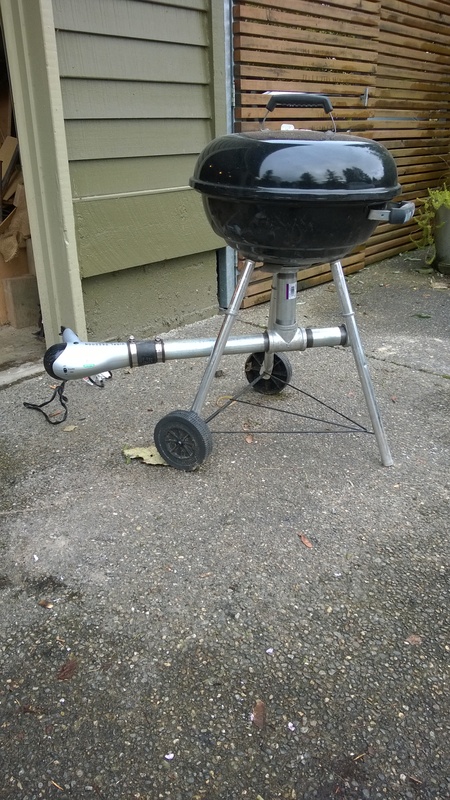 Today I decided to take a creative break and turn our old Weber grill into a foundry… because who doesn’t want to melt down old hard drives and turn them into art? 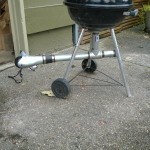 There are a number of ways to build a home forge using paint cans, flower pots, chimney pipes and more, but while planning out my strategy last night I came across a YouTube video by “LifeBuzzN” which used an old grill. Our old grill sitting behind the trash cans was just asking to get the treatment. First to Goodwill to pick up an old hair dryer then a quick trip to Home Depot (and then the requisite second trip to get the part I overlooked) and I was ready to go. 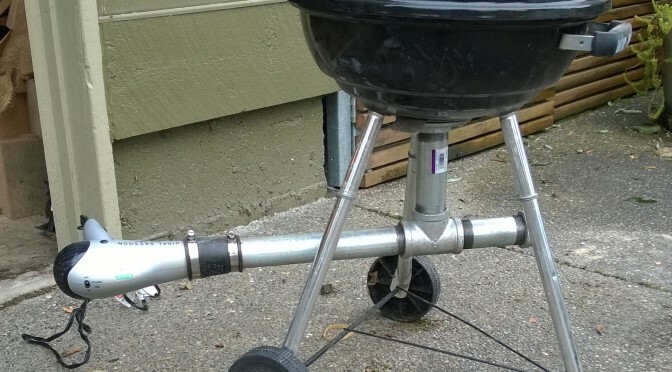 The setup is pretty simple, 1.5″ pipe is bolted to the bottom of the grill and an old hair dryer acts as an always-on bellows to get the coals extra hot. I used an old cast iron pot I also picked up at Goodwill to act as my crucible. 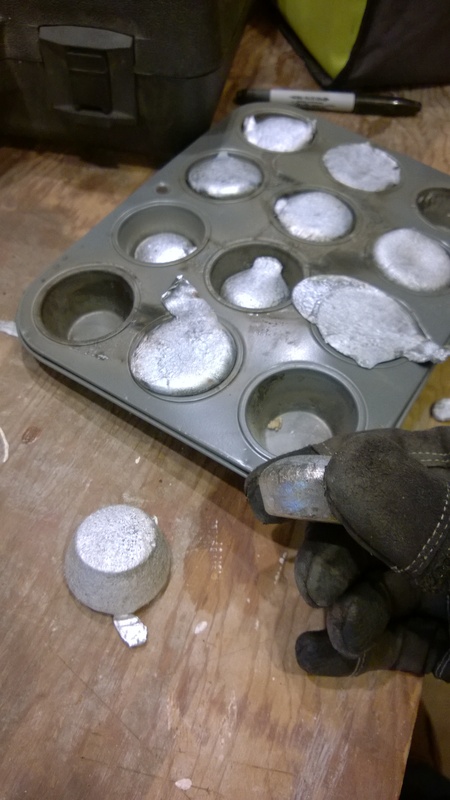 After a half a day of tinkering and learning I figured out just what was needed to turn old hard drives into aluminum mini-muffins (ingots, if you must). 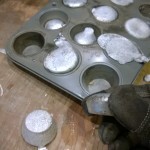 Aluminium ingots ready for reheating and casting. 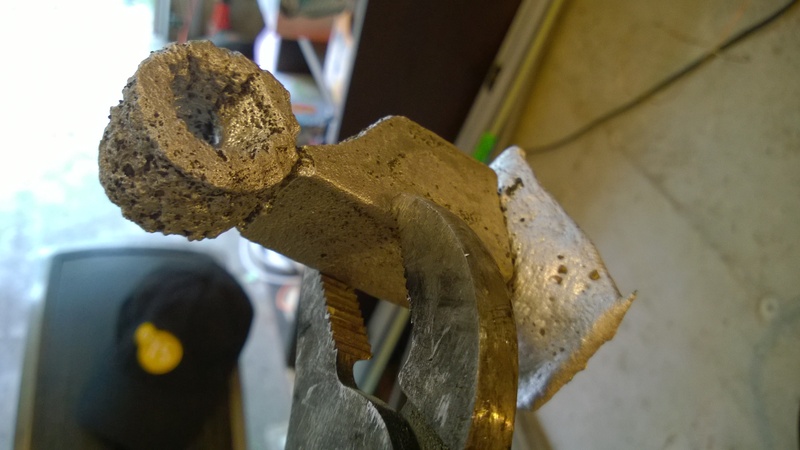 Since I had the forge going and a bunch of molten metal I had to try a quick casting. I made a hasty form out of some foam insulation and buried it in a bucket of sand. 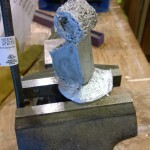 This “lost foam” casting process is quick and easy, leveraging the low boiling point of foam to have it boil away when molten metal is poured in. If you’re careful with your foam form and use a coating to keep the sand out you can get really clean results. I wasn’t careful, I was just to enthusiastic to try out my new toy. The result wasn’t pretty, but it was mine. 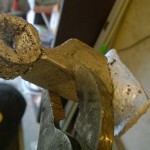 My aluminum ring with sprue still attached. Next up I’m going to try getting refined and use the lost wax casting process. I’ve ordered some casting wax from Amazon, so I should be ready to try to create something a bit more refined this weekend.